The waterproof and hard-wearing compact category used to be a one few manufacturers were willing to enter. The selection used to comprise Olympus's former SW range, Pentax's various W series and a handful of tank-like models designed for more industrial use, but today the situation couldn't be more different. Thanks to Canon, Fujifilm and Panasonic all pitching in with their own contributions, the once-stagnant sector is now awash with fun, colourful and even trendy models, complete with underwater-orientated functionality and an unprecedented level of resilience. 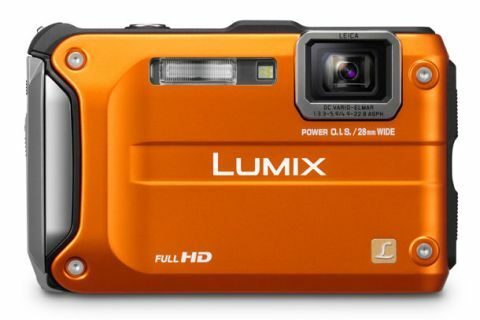 Having already made its mark with its lifestyle and superzoom cameras, Panasonic's Lumix series has expanded to offer an FT category, its models protected against water, dust, shock and freezing temperatures. Now, in its third generation, the latest FT3 model maintains the same dust, freeze and shockproofing as its predecessor, but increases waterproof capabilities to a depth of 12m underwater. HD movie recording has been boosted to offer the full HD standard of 1920x1080 in the AVDHC format, and the model also comes equipped with a GPS system for embedding location details within image metadata. Panasonic has also been generous enough to squeeze in a compass and altimeter too, as well as a barometer which can be used to show depth underwater. Elsewhere, the model reduces pixel count slightly over the 14.1MP FT2, with its 12.1MP Hi-Speed CCD sensor allowing 3.7fps burst shooting at full resolution, as well as 7fps option in Speed Priority mode and a rate of 10fps at 3MP. Optically the new model matches its predecessor, with a 28-128mm lens covering a 4.6x optical range and the provision of a 30-140mm focal range while recording movies, with POWER O.I.S technology also included to correct for blurry images. A Motion Deblur function now also features as part of the Intelligent Auto technology, which uses the Intelligent ISO system to regulate sensitivity (in turn increasing shutter speed), while a 3D option which combines two images from a pan of 20 to create a single 3D photo has also been thrown in. There isn't a great deal of manual control available, with exposure modes limited to Intelligent Auto and Normal options in addition to a variety of scene settings, but the Normal mode does allow many shooting parameters to be altered. Focusing option include AF tracking, face detection, 23-area focus, 1-area focus and spot focusing, while the long-standing Lumix colour options of Standard, Natural, Vivid, Black and White, Sepia, Cool, Warm are also on hand. These are joined by a 'Happy' colour option available from the Intelligent Auto menu, which heightens colour and brightness to make images appear a touch more jolly than usual.